Brian Coleman (aka Mr Toad) has got to go! : Rog T is plain wrong. Well, the headline of his latest post is plain wrong anyway. In fact, I often disagree with what Rog T says in his excellent blog. But he wears his heart on his sleeve, says what he thinks and is passionate about the things that are important to him. What's more he's proven that he's not afraid to take on the powers that be. 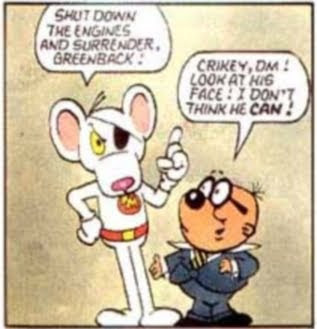 He's Barnet's own Dangermouse (no less) to Coleman's Baron Greenback. So I've been disappointed to read a few bits and bobs lately - from people who know little or nothing about politics in Barnet and its history - casting comment on Rog, his motivations and even on his wraparound shades. Therefore, in an attempt to redress the balance a little here is Rog's comment on the whole Coleman vs. Tichborne case. That's the one that decided that Coleman is guilty as I'm sure you remember. Its a very interesting read (providing you ignore the headline of course) and I hope that it gets a little wider publicity by being copied here. There are many things wrong with the local political scene in Barnet. I've written hundreds of blogs on the subject. It may surprise you to know that the vast majority of these don't mention our beloved Mayor Brian Coleman. Whilst I may have rather strong views on him, I can honestly say that I don't think he's the problem, he's just a symptom. Having reflected on the background of my standards complaint and having seen the standards process in action, I think it demonstrates all that is wrong with Barnet Council. Let me explain to you why I say this. I believe that the root cause of the problem is that senior Councillors and Council officers have lost sight of why they are there. They should be their to ensure that local services run as smoothly as possible and that the weak and vulnerable in Barnet are well looked after. They should try and make the environment in Barnet as pleasant as is possible for the residents. They should be respectful of the people who pay their wages (the taxpayer) and be prepared to engage and discuss issues with these people, no matter how difficult the individual may be. Given that the catalyst that started the whole process was Council Leader Mike Freer, describing his critics as "nutters" and "one handed bloggers", it is clear straight away that the leader has no respect for anyone that disagrees with him. When I wrote a polite email to the ruling group of Councillors, a senior member, Mayor Coleman thought the appropriate response was to reply to all recipients in an offensive manner. Did the group think "This guy has just abused a member of the public, he's out of control". No they did not, they elected him as Mayor, despite being under no illusion whatsoever, that he thought abusing the public was fine and dandy. Surely a few of them must have realised that this was a clear breach of the Standards code. Both Lib Dem leader Jack Cohen and Labour leader Alison Moore realised this immediately. The next sorry step on the trail was when Mayor Coleman asked Council Leader Mike Freer for a £10,000 indemnity to fight the case. I've spoken to lawyers and trade Union officials about this. They've all told me that the sensible thing to do would be to have apologised and drawn a line under it. That would have been the end of the matter. Now Mike Freer had seen the email exchange. Did he think "This is directly related to me, I cannot make an objective and transparent decision here". As Mr Coleman rounded off his email to me by saying "The Leader is totally right" and as it is crystal clear that Freer saw this, he was compromised. If he believed that Mayor Coleman had a good case, why didn't he let Council CEO Nick Walkley make the decision? He approved the decision to give Coleman an indemnity using delegated powers, meaning it was totally up to him. Barnet Council had an insurance policy that covered standards complaints. Coleman could have used this at no cost to the taxpayer. He chose not to and thought the taxpayer should foot the bill. At no time in Mayor Coleman's defence did he say that his email didn't breach the code. He knew it did. His defence was that he was provoked and that the fact that he couldn't tell me to bog off without being disrespectful was a breach of his human rights. From all the paperwork, he actually admitted the breach all along, just claimed mitigating circumstances. So we have a case being fought for vanity. A leader who instigated the sorry matter. Whilst the council cut thousands of pounds in grants from hard working volunteers, the Leader happily sanctions the spending of £10,000 on a case that was doomed to fail from day one. Not only that, but one which could have been avoided by an apology. The cost could have been avoided by using the insurance policy. Why didn't Freer send Mayor Coleman down this route? Because Brian Coleman was actually defending Mike Freer, in the only way he knew how, when he got himself into trouble. Finally this takes us on to the actual hearing. The way this works is there is an impartial investigator who prepares the report. They present their findings. The defendant's legal representative then gets their say. I asked for the right to address the committee, as I felt that there were points which needed to be brought to the committee's attention. I was denied this right. I was told that only the defence could speak to the committee. To me this goes against natural justice. In any normal hearing, there is a prosecution as well as a defence. Normally these standards hearings are held in private. It seems to me as if they are there to serve the purposes of councillors, far more than the public. Which brings me to my perception of the problem in Barnet. Sheltered wardens are cut, whilst Councillors allowances go up. Parents of dead babies see funeral charges rise, whilst councillors and council officials go on jollies to the USA and Cannes for "conferences". We have a Council leader who holds the public in contempt, but no cost is too much for defending his political allies. In short, the council is being run for the benefit of the senior ruling councillors and the senior officials." Rog - I hope you'll not mind me taking the liberty of pasting in your whole post. regarding a lobby at Hendon Town Hall next week, about the five-billion-pound plans for Brent Cross. We want to get the Secretary of State to call in the planning application. If you approve of the sentiments, please consider blogging about the subject - after looking at the links within the above web page. Thank you for your contribution, but you might want to go and check those scores again Anonymous.